Play Games, Listen Music, E-Book. USB Port, 3.5mm Audio Out Port. 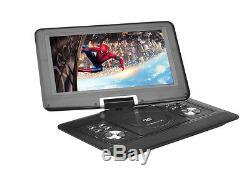 This 14 inch portable DVD player lets you take your media with you wherever you go, long car journey, flight, camping holiday, this DVD player has them covered. Anyone with kids dreads those long journeys that will stretch your patience to breaking point, with children yelling in the back of the car or becoming frustrated on long flights it can be a stressful time for parents, well here is a simple cure. 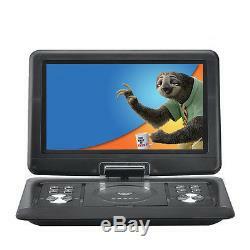 This 14 inch portable DVD player has 1280 x 800 resolution and with a 270 degree swivel screen can easily rotate to accommodate any viewing angle or placement. 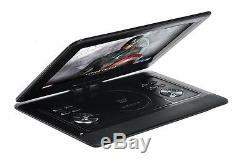 Bringing up to 2 hours of entertainment from a full charge this portable DVD player is a great way to keep everyone entertained and pass the hours. The Hitachi lens won't miss a beat and thanks to anti shock technology any bumps in the road will not interrupt the viewing pleasure as the reader scans ahead on the disc and plays from memory ensuring a silky smooth playback of all your DVD content. Region free support means you can play discs from any corner of the globe so even those movies you picked up abroad will work. With a SD card slot and USB port you can play music or movies from a memory card or pen drive so your DVD collection will take up virtually no room at all. 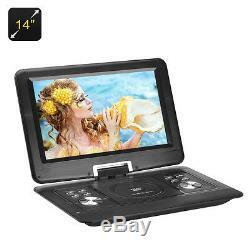 14 Inch 270 degree rotating screen accommodates any viewing angle or placement. Precision Hitachi lens and anti-shock ensure a silky smooth playback. Region Free DVD support plays everything in your collection. Games Emulation let you relive arcade classics. Aspect Ratio: 16:9 R. Functions: AV, DVD, FM, USB, SD card reader, Analog TV and game, E-book function, AV IN/OUT. FM Frequency: 87 to 108MHz. Video Format: MP3, MPG, Vob, AVI, FLV. SD Card/USB: Support up to 8GB. Li-Battery: Built-in 1600mAh Rechargeable Li-Battery. Usage Time: up to 2 Hours. Power Supply: AC100-240V, DC12V 2A. English, Chinese, German, French, Italian,ish, Portuguese, Russian. Region Free (Also known as region zero or no region). DVD, CD, EVD, VCD, CD-RW, DVD-R.
Video: MP3, MPG, Vob, AVI, Flv. SD / MMC Card Slot. 3.5mm Audio Out Port. Main Product Dimensions: 390 x 268 x 45 mm (L x W x D). This portable DVD player is a region free (also known as region zero) DVD player which means it can play DVD disks from any country of the world. 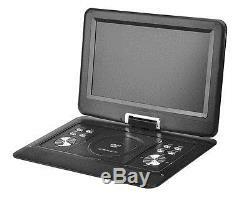 Check out the full range of Portable DVD Players in our Portable DVD Players Department. Posted in a safe and secure damageproof Post Pack. Shop for more great deals in our. We will always try to respond within 2 hours and are happy to provide any extra information you require. We try very hard to keep all our existing and new customers happy and satisfied. We provide free technical service for all our products. Car Accessories, DVR's, Stereos, Audio Video, Dashcams. DVD Players, HDD Media Players, Video Recorders. Electronics, IP Security Surveillance Cameras. At JapaTech we always strive to sell only top quality products and to maintain the best possible service. The team at JapaTech will provide trusted technical advice for all our products. Please read our feedback to see how good a service we provide. ABN: 13 153 484 391. 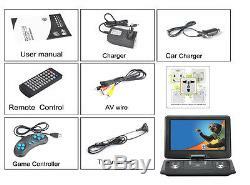 The item "Portable Multimedia DVD Player 14 inch TFT Screen, Hitachi Lens, USB, Game, Copy" is in sale since Monday, June 06, 2016. 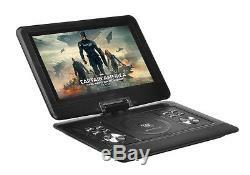 This item is in the category "Home Entertainment\DVD & Blu-ray Players". The seller is "japatech" and is located in Adelaide Store. This item can be shipped worldwide.